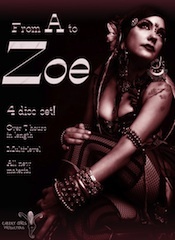 From A to Zoe by Zoe Jakes has over 7 hours of totally original content that touches on everything that Zoe Jakes personally focuses on in her own dance. She has taken her favorite exercises, warm ups, moves, and combinations and put them into a format that you can put into your own style of dancing. «From A to Zoe» video program is a good opportunity to enhance one’s dancing vocabulary. As for me, I find the content absolutely useful and clear. The quality of the video is enough to understand and follow the moves. Many things from Zoe’s style become clear after viewing this video and learning combinations. Perhaps, it might seem difficult to beginners. A: Thank you for your message. Yes, all of the DVD we sell work in France. They are NTSC Region 0 (All Zones).